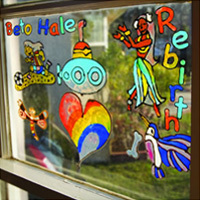 Beto Hale was born in Mexico City and brings a Latin spark and a true ability to appreciate his latin roots in his music. Hale's brand of carefully constructed pop-rock has gathered comparisons to very notable industry icons such as: Peter Gabriel and The Beatles. He is a true musician and a master of multiple musical crafts, a singer-songwriter, multi-instrumentalist and producer Hale has performed with some of the industry’s most notable acts. Hale underwent a period of soul searching, and refinement when writing and co-producing his third album. He wanted to rediscover the simplicity of music and the emotionally driven, catchy pop-rock. His latest album is entitled Rebirth. With half of the lyrics on Rebirth in Spanish, the album is a trip back through Hale's musical career to where it all started with a twist of latin spice and flare. Surely a refined collection of tightly arranged pop-rock with heartfelt lyrics—the catchy rhythms and uplifting lyrics provide the listener with an emotionally empowering experience. Certainly any listener can hear why there have been so many Beatles comparisons, whether it's within his crew of musicians who worked on the album or the light feeling of the Sgt. Peppers that courses through the album. The opening track "Explosiones" is an uplifting anthem, musically it sounds like futuristic U2 with a Latin Bono. "Falling Down" is a track that lyrically captures the ears of the confused and downtrodden hearts, in a sort of Tom Petty-like manner. Standout tracks include "April" and "Fire Away" the two most Beatle-esque songs, about love and reaction. Rebirth has something for everyone if you can break the language barrier or are not easily turned off by songs not of your own native tongue. If you cannot break that barrier you will have a tough time with this album, however I would encourage a listener to stay open-minded and respect Beto Hale's musicianship and knowledge of his craft.